Blog and other types of online subscriptions depend on something like RSS or Atom to tell an application, usually a browser or e-mail reader, where to find the information. My Blog supports RSS. The RSS feeds are simply a kind of document that describes content. OK, yes, they’re a little more complicated than that, but really, when you click a link for an RSS feed, you’re requesting a special kind of a document. What happens next depends on your browser and how its configured. All you do to create the subscription is click Yes. Of course, you might be using another e-mail application. 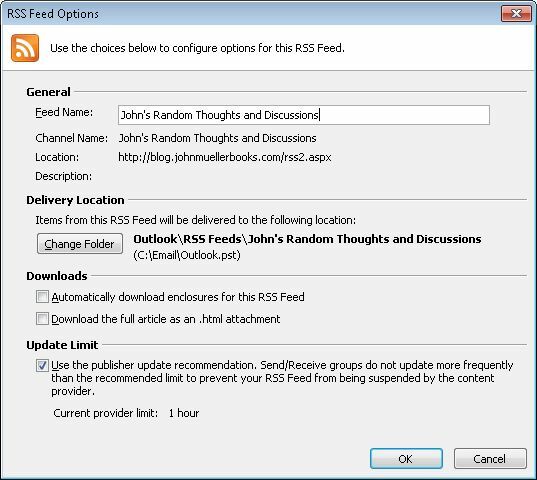 Whether you can even subscribe to RSS feeds depends on the capabilities of your e-mail reader. However, even if your e-mail reader can handle RSS feeds, your browser needs to know about it before the e-mail reader will be activated in response to an RSS feed click. In some cases, the two applications simply aren’t talking to each other. Unfortunately, because there are so many conditions and so many software packages, there really isn’t any way I can tell you how to create a connection when there isn’t one. You need to talk with someone who can actually look at your machine. You can still use your browser to review the feeds. Only one of my browsers (I have three installed) has a plug-in for Outlook installed. So, when I click on the Entries RSS link (see Subscribing to My New WordPress Blog (Reposted) for details) in Internet Explorer, I don’t see a copy of Outlook open. Instead, I see the following page describing the feed. 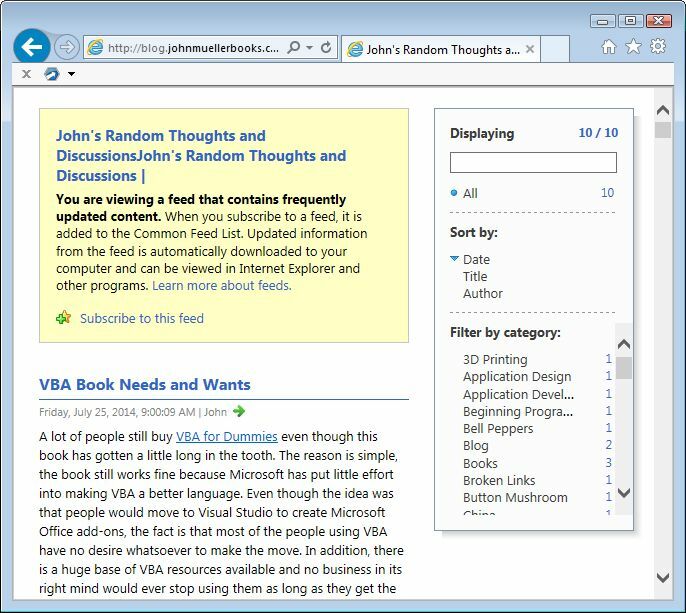 An RSS feed page in Internet Explorer. The page contains a listing of all the current posts. Notice the yellow box. At the bottom of this box you see a Subscribe to this feed link. Click this link and you get a subscription to the feed in your browser, not in your e-mail reader. This means that you need to open your browser, rather than your e-mail reader, to see the latest posts, which is admittedly inconvenient. Even so, you can get a quick listing of the posts for all of your favorites sites using this approach. I wish that there was an easy fix for this problem, but the fact is that if you’re seeing the browser, rather than your e-mail reader, when you try to subscribe to the blog, the problem is one of connectivity. All that I can provide is the document containing the description of the posts and where to find them. Please let me know if you have any additional questions about subscribing at John@JohnMuellerBooks.com. A number of people have reported that they’re no longer getting their feeds from the blog. So, I’ve reposted these instruction from June 27th to help out. Please feel free to contact me if you have any questions. I want to be sure everyone who wants access, has access.